Local student wins cash prize for her school. Chartridge Combined School from Chesham in Buckinghamshire recently took part in Clarks of Amersham ‘design our mug’ competition and won first prize of £300. The winning student Lucy Wood from year 5 also won a £50 gift voucher and the mug with her own design on it. The competition was open to all junior schools in the Buckinghamshire area and armed with a template and some colouring pens they set to work. Clark said, “For the last 10 years we have commissioned artist to produce our special mugs – 6 in total to date – but this year we wanted to have some fun. We will definitely be running this competition again. Head Teacher, Jo Mason and Lucy Woods were both on hand to accept their prizes in the school assembly last week. Lucy had picked out her gift and the school had yet to decide what to spend the cash prize on. 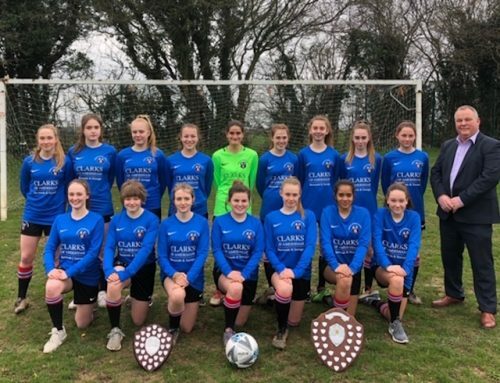 Chesham Grammar Girls scoop top football trophies. Protect yourself against identity theft. Why businesses need Document Storage? Moving House? How to avoid the removal cowboys.